I think the hardest part about decorating a new home is figuring out where to put the decorations you’ve used for years that you love. 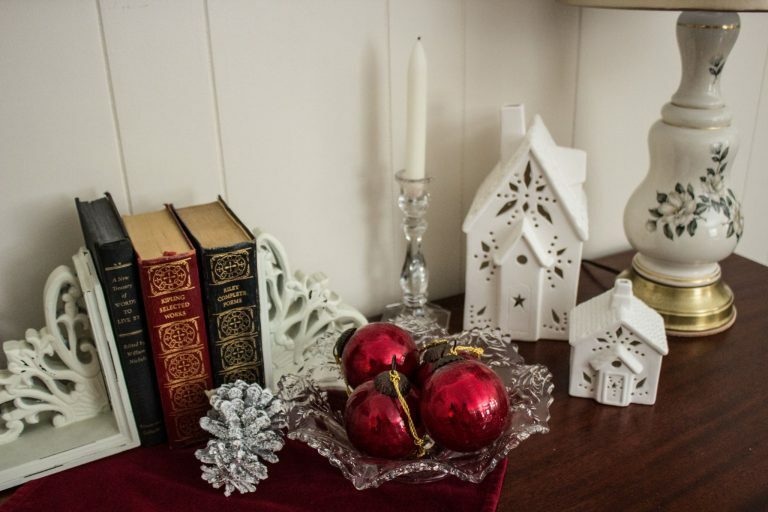 In our old home, I knew where everything went and it became almost a tradition to put certain decorations in certain places. Some of the decorations that worked in the old house, just didn’t look right in this one, others I just couldn’t figure out where to put them. So many areas to decorate. It’s kind of surprising that I couldn’t figure out where to put some of them. Some I’ll be getting rid of and others, like Jim’s Norman Rockwell collector Christmas plates, will be kept. Our new home is so big (big being a relative term compared to our old house). It feels like I should be able to do a lot more decorating. But having more space just seemed to make it harder. 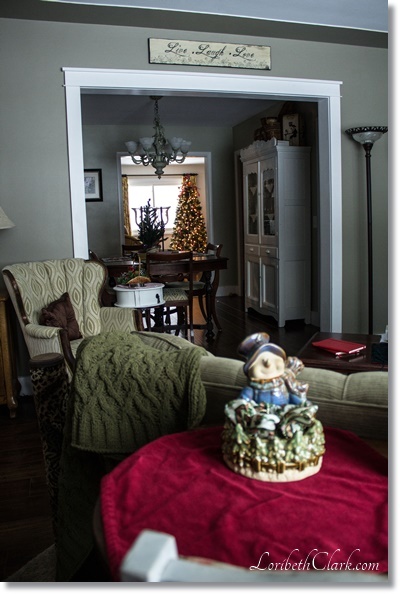 I’ve never decorated this house, and the usual places…well, they aren’t usual. It would have been easy to just go out and buy all new decorations, but that doesn’t feel authentic to me. 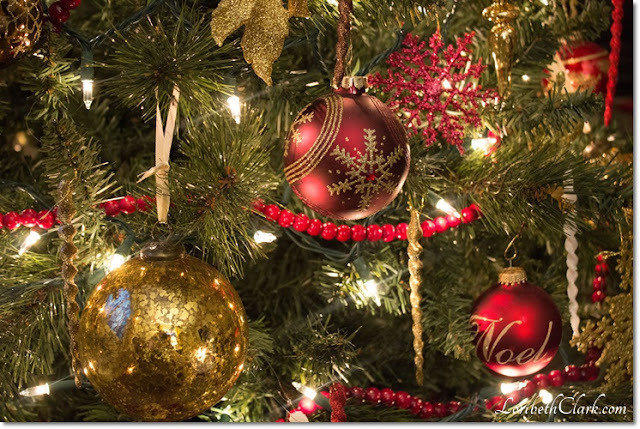 Christmas is about tradition, bringing out the well-loved decorations that remind us of past Christmases. 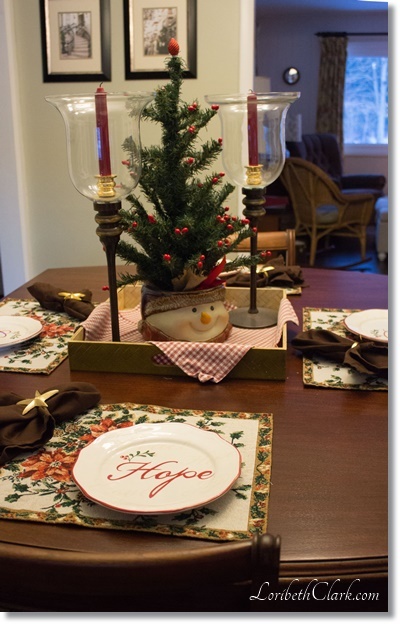 Since this is our first Christmas here, I’m just getting to know the house and learning what feels right, so next year I’ll add some more decorations to the ones we already have–including a display rack for Jim’s plates. For some things, like it was easy to know where to put them. 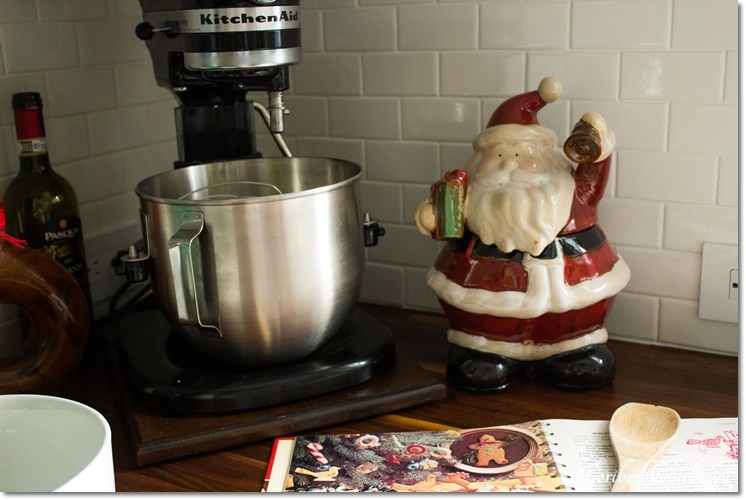 Things like my Santa cookie jar goes in the kitchen, next to my KitchenAid to oversee the making of Christmas cookies. That’s where he’s always gone, and that’s where he’ll continue to go every year. He has temporarily usurped my kitchen rooster, but I think the rooster understands–even a rooster deserves a holiday. Right? After all, the Christmas cookies need a cookie jar! And the sweet smiling Frosty I found in a second-hand store. He’s been the centerpiece on our dining table since our first Christmas together. His smiling face makes me smile, so he goes back on the table for sentimental reasons. Those two were no-brainers. I didn’t even have to think about where to put them. That made things a little easier, and they make this house feel more like home. 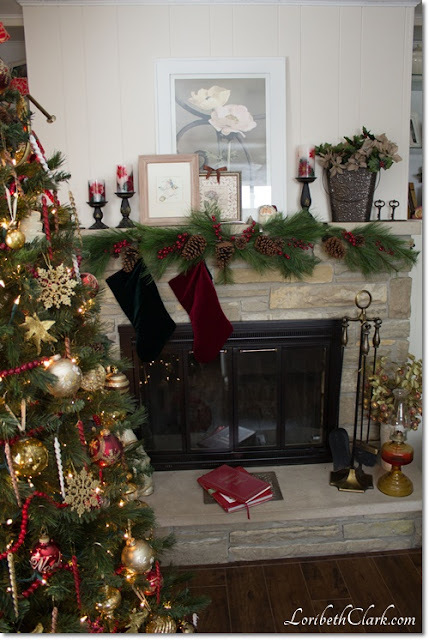 The stockings were hung by the fire with care. I also didn’t have to think about where the Christmas tree would go. It was going in the sitting room by the fireplace. 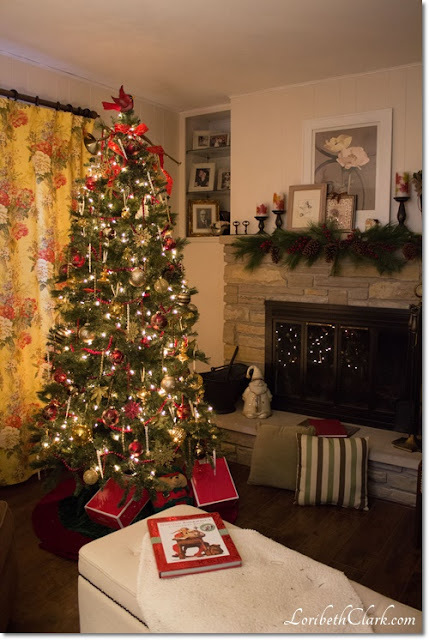 Even though it’s our first Christmas here, I knew that’s where I wanted it to go, because I’ve always dreamed of having a Christmas tree next to a fireplace with stockings hung on the mantel with care. Well, I finally got it! 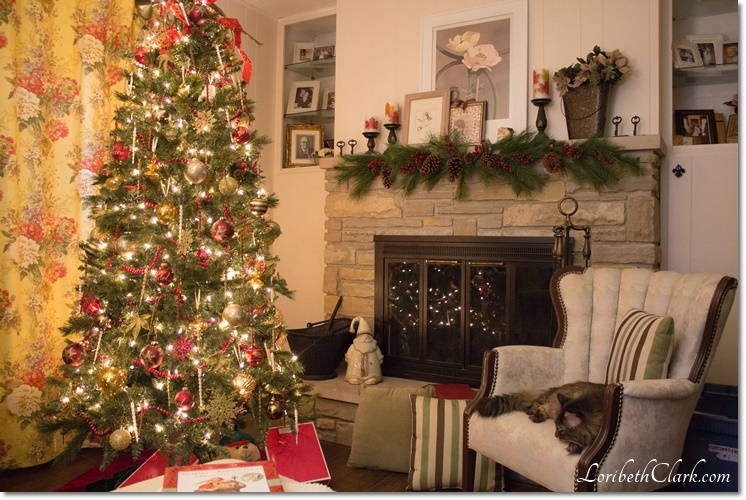 The sitting room got decorated the most, probably because of the fireplace. Real or reproductions? Who cares, as long as you love it. Also in the sitting room are the German Kugel ornaments I picked up a few years ago at a garage sale. I don’t know if they’re real or if they’re reproductions, but I love their red color. They’re very heavy, so I like to display them in a bowl on a table because I’m afraid they’ll break if I hang them up. Don’t they look pretty next to my two white Christmas village houses? My mom used to set up a huge Christmas village every year. I used to set up one too many years ago, but not on the scale of hers. Now, I love the simplicity of these two white Christmas village houses. 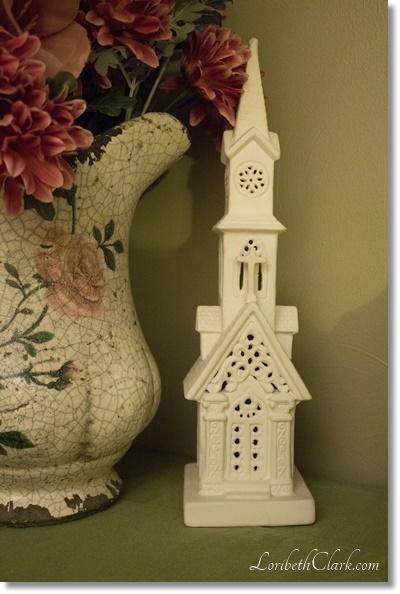 I also have a white Christmas village church, that I display all year around. It’s a tradition in my family to keep a Christmas decoration displayed all year in order to keep the Christmas spirit alive all year. Having a Christmas decoration out all year keeps the Christmas spirit alive. 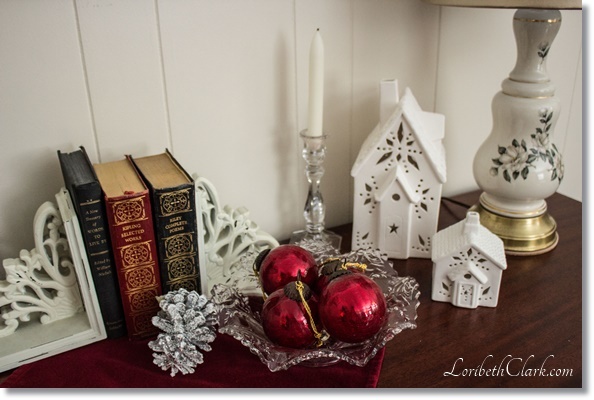 Since our home has a bit of a French Farmhouse vibe, I’ll be looking for some more rustic looking Christmas decorations for next year… Some of the old decorations I have, like the bright red and green plaid tablecloths, just don’t work in this house. They feel out of place. 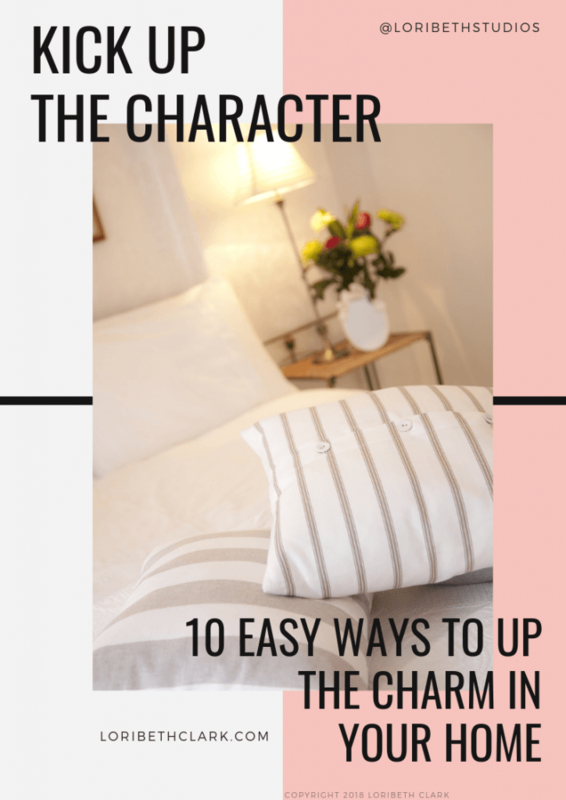 That’s why it’s good to get to know a new house before rushing out to buy new decorations. The house will letting me know what’s authentic and what feels wrong. I did make one exception to the “no new decorations rule” this year. This Father Christmas Santa is the only new decoration I got this year. 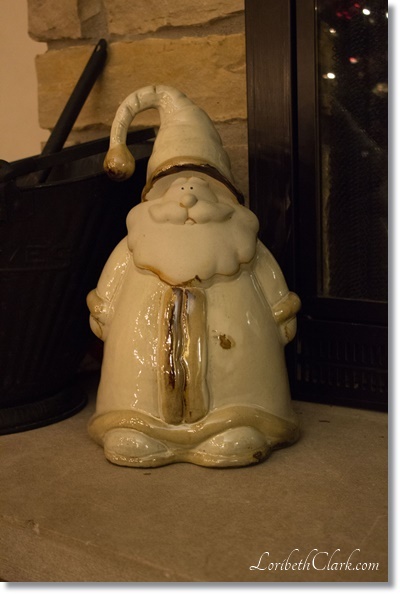 I found him at a yard sale this summer, and I knew he’d be perfect sitting on the fireplace hearth. I give myself a pass on this one because I actually bought him before I decided not to buy new decorations. He was the only thing I bought at that yard sale because I fell in love with his face with his beady little eyes. The Christmas tree all decorated. Jim and I bought this tree for our first Christmas together eight years ago, and this year is the last year that we’ll be using it. I’ve decided a larger one would be better, and Jim agrees. This one was perfect for our old house but feels a little small here. It’s kind of sad when you think about it… maybe it will get a new life as a decoration in our family room once we finish the basement. Although, since it took me a whole week to decorate it, maybe not. We’ll see. It might be nice to donate it to a family who can’t afford a nice tree. 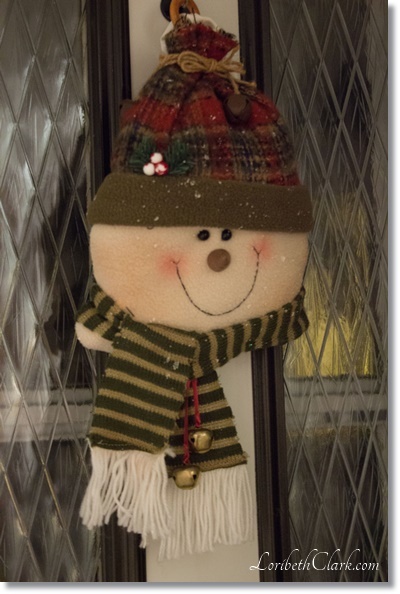 A smiling snowman for the back door. The back door has a bit of Christmas cheer too with a Snowman I found at a second-hand store a few years ago. He’s the only decoration that got put up last year at our old house. We didn’t decorate last year for a couple of reason. My dad was going in for major surgery, and we were busy with renovating our new house. It just didn’t feel like Christmas last year. I’m so glad that’s not the case this year. Dad is cancer-free finally after seven long years. Now that’s something to celebrate!! 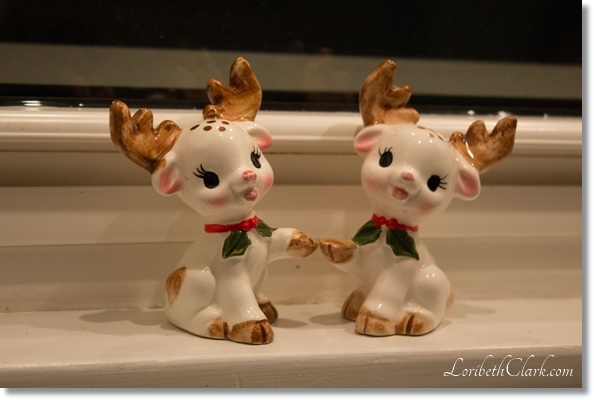 Reindeer salt & pepper shakers found in the house when we were renovating. Before I end the tour, I had to share these little guys with you! We found them tucked in the back of one of the original upper cabinets in the kitchen before we tore them out and gutted to renovate. Aren’t they adorable?? I had to keep them. It feels like they belong here since they managed to stay even after the estate sale people emptied the house. I don’t know how old they are, but I do know they’re special. Well, that’s pretty much the whole tour! It’s hard to believe that 2016 is coming to an end. We haven’t even been in our new home for a whole year yet. Last year at this time, we were installing flooring, and now we’re celebrating our first Christmas here! Every day I count my blessings…a wonderful husband, a loving family, two beautiful fur-babies, a nice home, and so much more. My favorite room in the house this Christmas! Merry Christmas, Happy Holidays and a Blessed New Year to everyone from the Clark family!! You did an outstanding job on the house. You can clearly see that you are an interior designer. I love the idea of always leaving one Christmas item out all year. You have a keen eye for detail and think so creatively. Thanks Kate! We love our house. It's exactly what we wanted and turned out just the way I imagined it. I sometimes feel like I should pinch myself to make sure I'm not dreaming. Leaving a Christmas decoration out has been at tradition in our family for as long as I can remember. My mom started it when we were kids.